You have a goat, tied to the fence of a circular paddock. The paddock has a radius of 100M. You want the goat to eat HALF of the grass. How long does the rope need to be? Assume an even covering of grass, and don't worry about the goat's neck length etc. Re: Trickier problem than it seems. But given it's "trickier than it seems": I have no idea if the goat can/wants to eat the grass fast enough to actually eat "half the grass". In any case it needs extra nutrition beside grass. The rope is tied to the *edge* of the fence, so the region the goat can eat is actually the intersection of two discs. You're looking for a radius r, of a disc centered on a point on another disc's boundary, such that the area of the intersection of the two discs is half the area of the second disc. Goats never eat all the grass, leaving the roots intacts, so you can just let the goat roam free in the enclosure. It'll eat roughly the upper half of each blade of grass. Ok, trick answers aside, it still seems straightforward enough. Let r1 = 100m, r2 = length of the rope. We have an equation with three variables r2, alpha, beta. The fourth, r1, is a constant. Solving for anything is tricky, because the formulas are a tangled mess of triginometric functions that are difficult to untangle. At this point, I'd just solve numerically. I didn't want to solve that by hand, and Wolfram Alpha couldn't even interpret it to begin with. If anyone wants to solve that...or check it for mistakes...feel free. EDIT: Ninja'd by Tub. 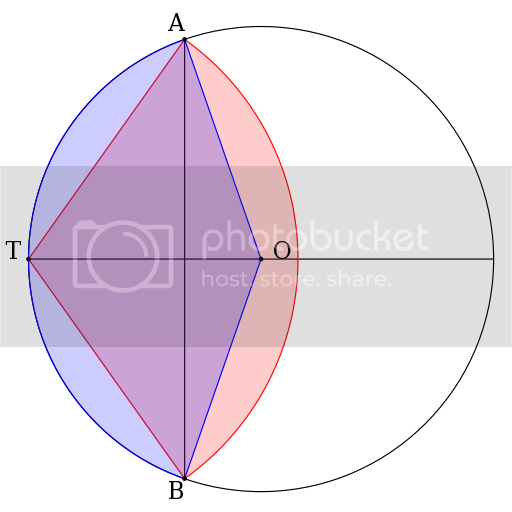 I don't think that alpha and beta can both be convex. The radius of the paddock must less than the length of the rope, which means the centre of the paddock falls between the centre of the arc swept by the rope and the chord joining the points of intersection of the circles. We can't just be straightforwardly adding the area of two sectors, in any case. Carlington wrote: The radius of the paddock must less than the length of the rope, which means the centre of the paddock falls between the centre of the arc swept by the rope and the chord joining the points of intersection of the circles. That is true. And as the chord from I1 to I2 is between C and T, that means that the inner angles at both C and T must be smaller than 180°. Carlington wrote: We can't just be straightforwardly adding the area of two sectors, in any case. Not sectors, segments. Follow the link I gave. On each side of the chord is a circular segment. Ah, that does make it trickier than it seems, when you misinterpret the question. Though something went wrong here, because the left hand never reaches an area of 1 and is negative by the time you fill the whole paddock, and consequently wolfram says its solutions are complex. The length of the rope is approximately 2/√3 times the radius of the circular paddock fence. If I'm understanding the Mathworld formula correctly and haven't made any input errors, then setting d = r for their equation we get the following formula for the area, A, in terms of the radius of the paddock (the smaller circle), r, and the length of the rope (the radius of the larger circle) R: . Wolfram|Alpha easily simplifies this, under the assumption that r and R are positive real numbers, and then if I simpify it further by setting r = 1 (and therefore A = π) I get: . Now, Wolfram|Alpha really tries hard to solve this ugly but seemingly innocuous equation. I mean it really spends a tremendous amount of time computing considering I haven't paid for extra computing time. It doesn't seem to give up. But I can't seem to coax it into giving a solution. Whatever the solution to this is, simply multiply by r = 100 m and that is the answer. Last edited by Eebster the Great on Sun Jul 10, 2016 5:23 am UTC, edited 2 times in total. I was hoping for a numerical approximation. Eebster the Great wrote: If I'm understanding the Mathworld formula correctly and haven't made any input errors, then setting d = r for their equation we get the following formula for the area, A, in terms of the radius of the paddock (the smaller circle), r, and the length of the rope (the radius of the larger circle) R: . I don't think your equation is correct. By inspection, R=2 satisfies the equation and we are all fairly certain at this point that it is not an integer. The negative solution is about -0.85, which I don't believe has a geometric interpretation in this scenario. Eh, the solution won't be quite correct anyway since it probably is bound around the throat and can reach a bit further than the rope length. So, 100 is obviously to little, at 141 it includes the half you get from drawing a straight line through the center+quite a bit more. The missing area under the line must be as big as the extra area over the line. I think 120 would be a bit much since the not filled areas will be long but narrow I think. So I guess 115 or so, close enough for goat feeding. PeteP wrote: Eh, the solution won't be quite correct anyway since it probably is bound around the throat and can reach a bit further than the rope length. When we were given this in a secondary school maths class, in the '80s, the teacher ummed and ahhed a bit over this detail then proclaimed that the length of rope needed to tie the knot around the goat's neck/onto the goat's collar was (by complete coincidence) the same as the extra reach the goat could gain advantage of. No, I can't remember our answer, but it was roughly calculated as above. Whoops, well no because I set A = the area of the enclosure instead of half that area. Obviously in that circumstance R = 2 ought to be a solution. But if we replace π with π/2, it should be right. But yeah, A133731 (linked on the mathworld page) has more digits. A133731 - OEIS wrote: Decimal expansion of goat tether length to graze half a unit field. We can simplify the equation for r a little. There's a simple relation between the two angles because they are in an isoceles triangle, so we can eliminate one of the cos-1 calls. The function for psi can easily be solved using Newton-Raphson. Here's some Python code that uses that method to calculate r to the precision supported by normal Python floats (IEEE 754 double-precision). Finally, here are 1000 decimal places, calculated using the earlier code, plus a little bit of extra code to do the formatting. I've created a diagram in SVG for this puzzle. Here's the SVG code. Just save it to a file with the .svg extension and you can view it in your browser. <input id="slider" type="range" min="0.50" max="1.50" value="0.50" step="0.001"